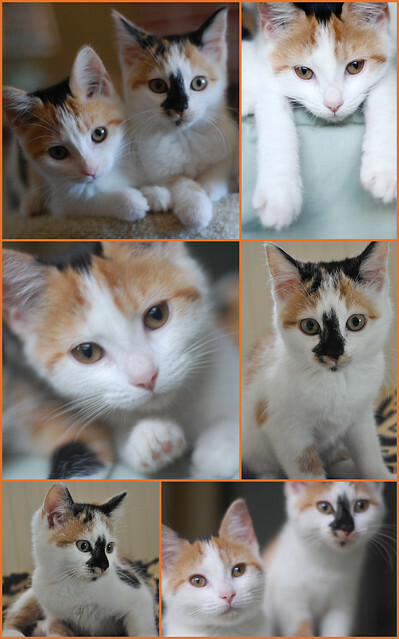 Victoria Anne and Cheryl are still on the hunt for their forever home. They've been spayed, vaccinated, and micro-chipped too. Their suitcases are packed, and they are all ready to go. We're hoping to send them off together, they are quite close and we're a firm believer that kittens need company. Victoria is a sweet, sweet girl. She's the quieter of the pair, but is by no means shy. She loves chasing ping-pong balls, watching television, and curling up on our laps. She's a beauty with striking amber eyes and a pink nose. Cheryl is a chatty girl and is very good at expressing her needs with her squeaky little cry. She's goofy, animated and snuggly too. She loves playing with sparkle balls and wrestling with her toys inside boxes and clothes baskets. The quirky markings on her nose and chin make her absolutely adorable. Both girls are loving, trusting, social and affectionate and will be a lovely additions to someone's life. Are you in the market for a special pair of kitties? Are you in the Seattle-Tacoma area? If you are, please shoot an email to kittywrangler(at)gmail(dot)com and tell us a little bit about yourself and the kind of life you could offer a pair of kittens. Or, if you're not in the market, but know someone who is, please send them our way! In the meantime, I know they are in the perfect place they can be. I'm with Waheeda, who took Opal??? Crossing my fingers and sending out good thoughts for Cheryl and Victoria Anne! I really hope they go together. I just know that these girls are destined to bring tons of joy to someone's life. They truly are beautiful girls. I hope they find a home together too. I also hope these two beauties get a great forever home together. And congratulations to Opal on her new family! I think Butterbean should adopt Victoria after seeing how much love those two have for one another! Oh, how I wish I could take these two girls! Or that my sister in Seattle could -- but alas, her senior cat won't allow any other felines in the house. I know the perfect home will come along quickly for this precious pair, though. And I do hope we'll get an update soon on Opal and her new family -- lucky them! They just HAVE to stay together. Fingers crossed. I have shared these lovelies! Pleeez, who adopted sweet kitten Opal???? Beautiful babies. I hope they find THE BEST home! Don't worry girls, your forever home and forever family is just around the corner, I'm sure. In the meantime, enjoy Butterbean's attention and lessons. I can't believe these two haven't been scooped up yet... must be because everyone is so busy with back-to-school stuff. Can't wait to hear about Opal and her new family. How have they not been snapped up by some lucky SEA-TAC resident?! If only you would ship them to Manchester, England then my grumpy old tabby cat would love some calico company! I don't think I've ever wished more that I were in your area than I do with these girls! They won my heart from their very first pictures. I hope someone picks up these sweeties right away! I do love Cheryl's nose!!! I could be tempted, but I live in the wrong country!! Sarah, I don't want to speak for Laurie, but my guess is that if you can make the drive down there, that could work. Not sure if there are any customs issues w/ bringing cats across the border? Sorry, but for numerous reasons, we won't send kittens out of the country.